That’s what you say at the big gates on Eighth Avenue near Logan Street. You press the callbox button, and state your name and purpose. At the Governor’s Mansion for the past seven years, a select group of gardeners has been standing at the gates saying: “I’m here to garden.” They let you in, and in you walk, waving at the obliging state troopers and scanning the upper level, around the pergola, for your gardening buddy. There she is: near the herb garden, hauling a hose over to top off the rain barrel. The most virtuous gardeners arrive early. They’ve already walked the beds much as army generals inspect their troops. Is there pest damage to address? Weeding to be done? Pruning? Watering? Cajoling? In June, Despairing is the primary mood upon a review of the ranks: Will these tiny seedlings ever, ever, we ask, produce food? “I was on the Volunteers for Outdoor Colorado team that planted the Governor's Mansion garden this year. I live in a condo with a balcony just large enough for some container gardening. I wanted to get my hands a little dirtier, while contributing to the mission of feeding people fresh food. Barbara Masoner, Grow Local Colorado’s head honcho, assures us, yes, the plants will grow. She has done this before. Barbara has been through this Grow Local outpost—she has nine productive gardens—all powered with volunteers. A first wave preps the garden beds and plants the seedlings. 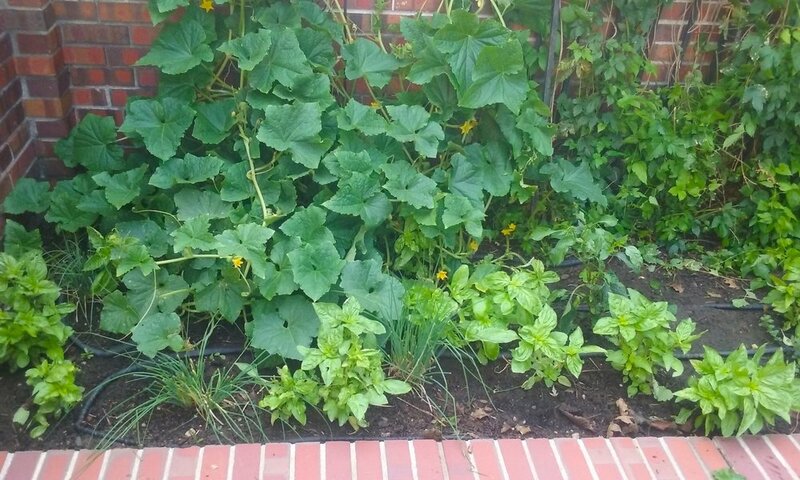 Then the gardeners take over, from June through October. Why? For the Governor’s Mansion cohort, the answer is easy. Hunger relief, for starters. On the grounds of the Boettcher Mansion, you’re able to help, reflect, think—sometimes alone, but often with fellow gardeners. We manage to grow about 200 pounds of food each year, just our group. And we take it all to Metro Caring, who can get the just-harvested food to those who need it the most. 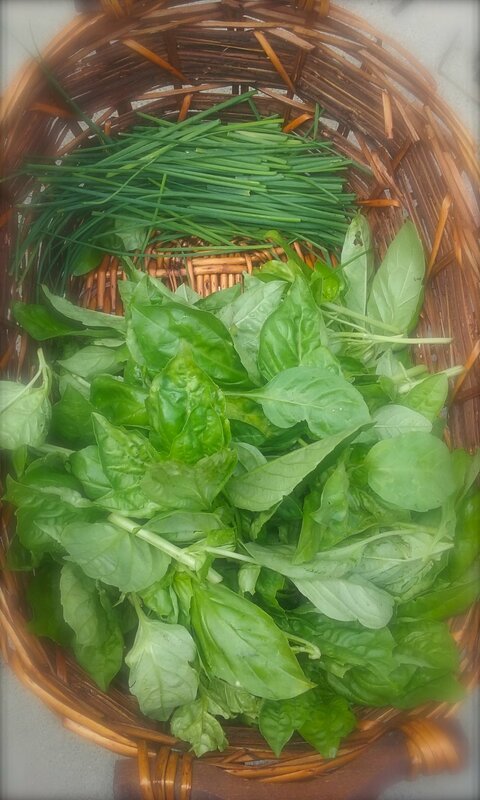 All told the Grow Local Colorado gardens produce, on average, around 4,000 pounds of nutritious food to share with the community each year. Tucked in among a landscape dominated by tall evergreens, lilac bushes, hollyhocks, peonies, and roses, are Grow Local’s lettuces, cucumbers, eggplant, and Anaheim peppers—by September all bending beneath the weight of the harvest. The seedlings did grow. The gardeners did weed and prune. The sun did shine. The rain did fall. And when it didn’t, the driplines did drip. By the carriage house in September, fruit ripens in the south-facing, sun-soaked beds hedged with yellow and orange calendula, or marigold. There are pepper plants too. 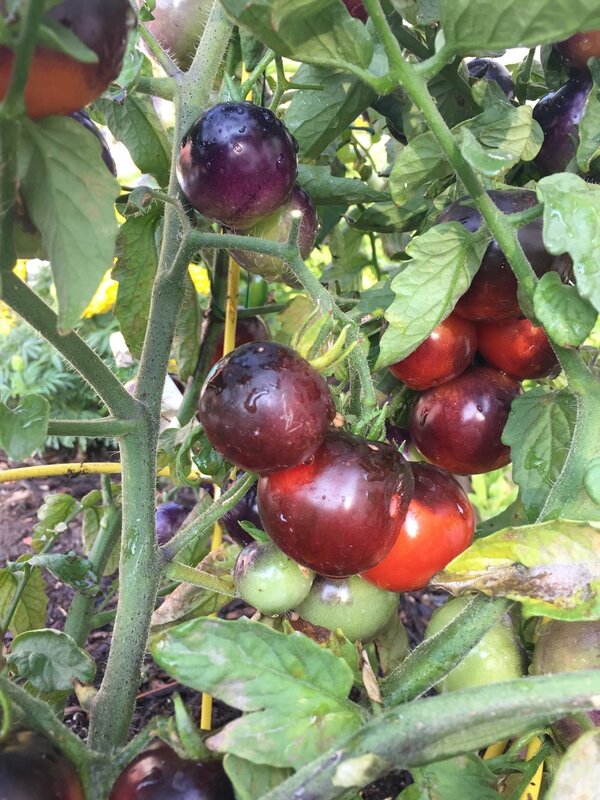 This year, a tomato variety, “Indigo Rose,” has ripened into purple glory, rich in anthocyanins, a flavonoid. We can never remember their name and call them Indigo Girls. We are compelled to sample a few stray tomatoes, as large as plums—are they ripe, we ask?—while the fruit cascades into our upraised hands and harvesting totes. In October, despair has given way to gratitude. In 2017 we were not set back on our heels by hail or snails or voracious bunnies. It was a good summer. We’ll be back next year for a new cycle of June despair to September gladness. One gardener has already sketched out a planting plan. 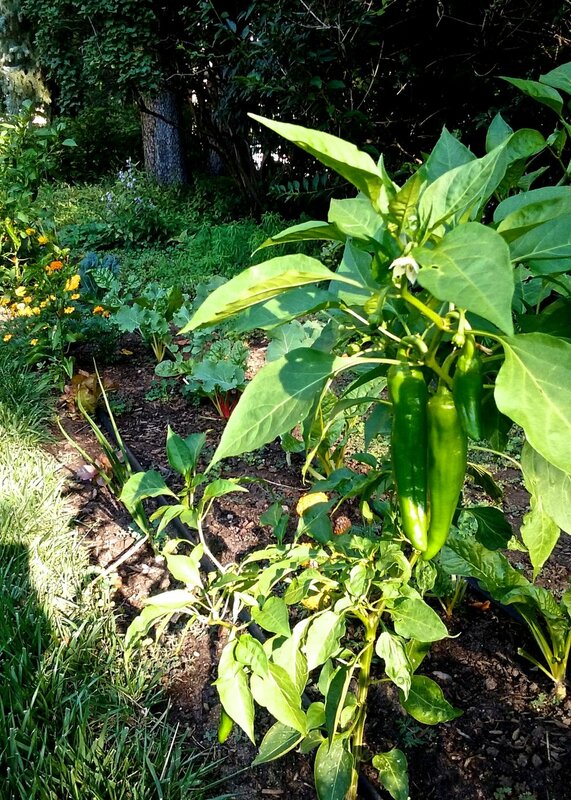 More peppers along the north bed, grouped together, we think, with the calendula a hedge against the undergrowth. More eggplant, too. We think Barbara will approve.